I had Ameri-Mech install a humidifier to my heater since my house gets really dry in the winter, and I can tell the difference in how much easier my young children can sleep at night. They also installed a new touchpad thermostat for me after seeing that my system can run more effectively and keep my energy costs low with a thermostat that is accurate and one that can be programmed with a schedule. Fast and knowledgeable! Fantastic, fantastic, fantastic!! These guys are real pros. They’re honest, reliable, conscientious, reasonably priced, and best of all, they do great work! We’ve had them do several jobs for us and we’re always super happy with everything they do. Tim is a real artist when it comes to installing a furnace and it’s amazing to watch him work. We are so impressed with his attention to detail and quality workmanship. At one point, on a jobsite, I was trying to take down a microwave from the kitchen wall. Several other contractors were in the kitchen with me at the time, none of them came over to help me with it. As I was struggling, Todd walked by on his way to the truck, saw me and rushed over to help me take it down. That says it all; these guys go above and beyond and are totally dedicated to customer satisfaction! Todd, Tim and Jeremy did an outstanding job of not only fixing my central air conditioning system, but in telling me exactly what was wrong with it and explaining what they were going to do BEFORE they did it. They were very professional, showed up when they said they would and cleaned up after they were done. They even gave me tips on how to balance (or should I say, not to attempt to balance) my vents to get the most efficiency out of my system. I would not hesitate to recommend them to anyone for air conditioning repairs! They were very professional and friendly. I felt like they were honest and respectful to me, unlike other companies I have dealt with just because I am a stay-at-home mom, they didn’t give me the runaround. My furnace wasn’t working, and instead of trying to get me to buy a brand new one that we wouldn’t have been able to afford, they came out, found the problem, fixed it, and gave my furnace and A/C unit a complete service check just in case there were any other problems. 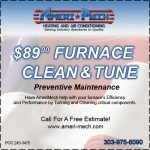 I would definitely call Ameri-Mech again!